This week it was my Grandaddy’s birthday, and we invited him over for dinner. What’s a birthday dinner without dessert?!? I have also recently been watching Pioneer Woman. 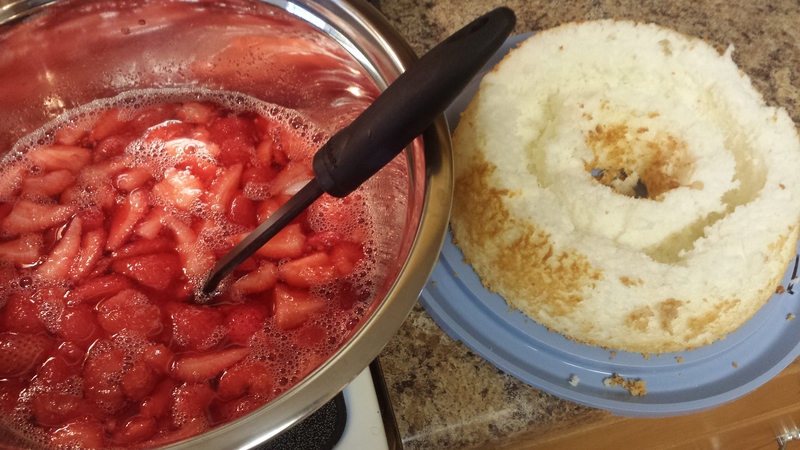 I decided to do the Strawberry Sparkle Cake from Pioneer Woman. We skipped a step, and just decided to get a box of angels food cake mix. We used a bunt pan. 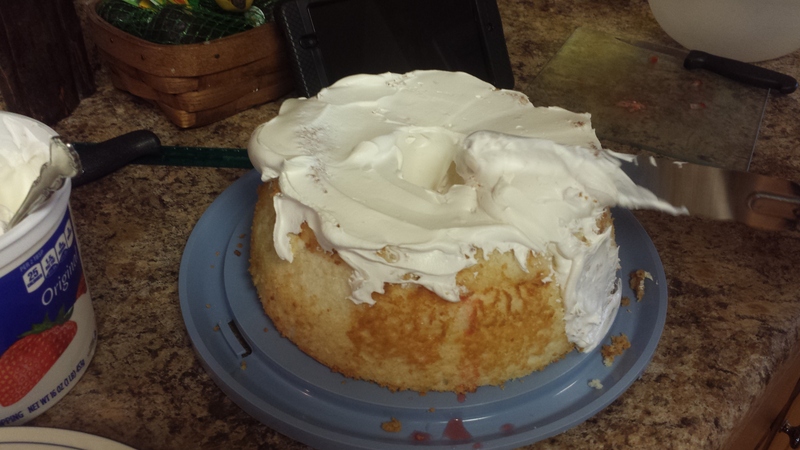 After making the cake from the mix, we had to turn the cake upside down to cool, and we used a Cream Soda bottle to do this. The next day, we had to “edit” the cake. You need to cut a 1 inch round slice of the cake of from the top. Then you need to cut 1 inch from the inside circle, and 1 inch from the outside of the cake. You are making a trench so, don’t cut all the way to the bottom of the cake either. 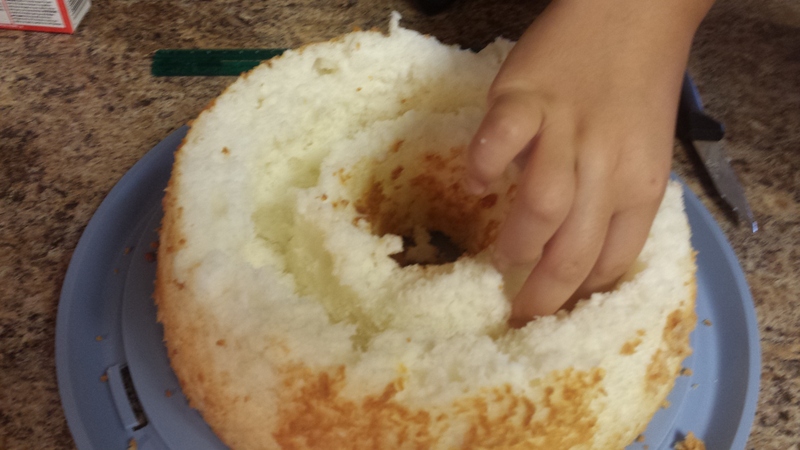 Next reach your fingers in there and start to pull the cake out. 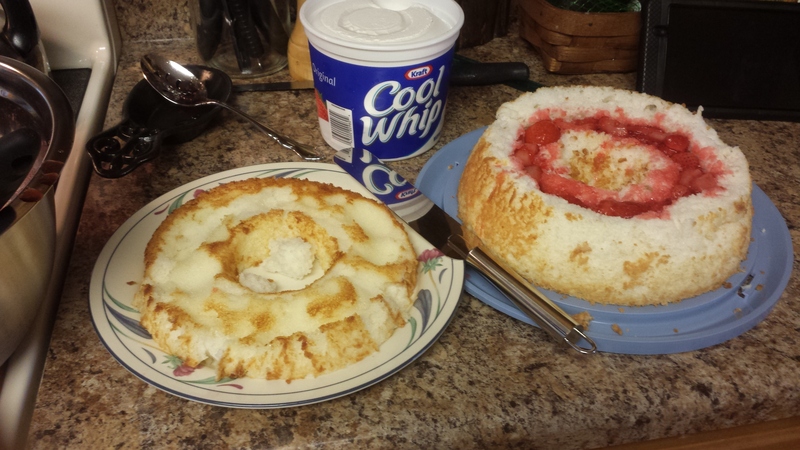 Then, we got out our Strawberry Jello and frozen strawberries. The website said that we needed 2 1/2 cups of water for 3 ounces of jello. The website was wrong! On the show, which is on Netflix, Pioneer Woman said only 2 cups of water. My mom and I doubled the recipe, because we had a 6 ounce package of jello. So, we put in 5 cups of boiling water with the jello and sliced frozen strawberries. Guess what? The jello was very liquidy and wouldn’t start to thicken. I apologize for the confusing math. Finally, we added some another pack of jello mix and used a slotted spoon to add the strawberries into the trench. 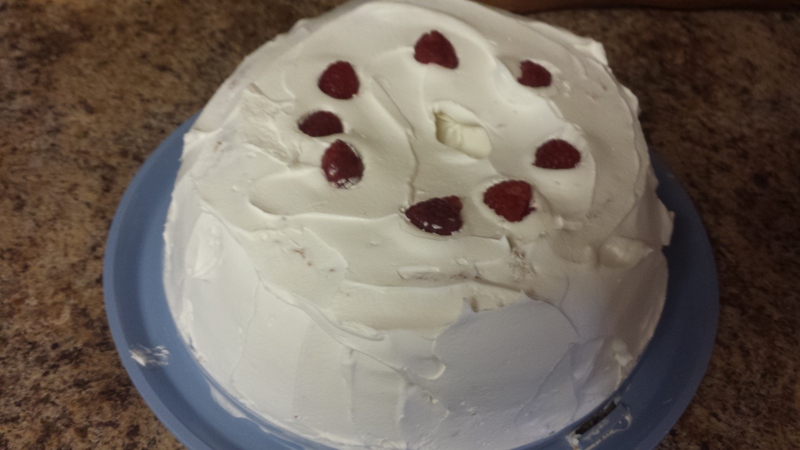 Put the ring you cut of back on top of the cake, and cover the whole thing in whipped cream, my moms favorite part! This is the finished product. We added some raspberries on the top instead of strawberries. Hopefully, Grandaddy and you will enjoy the cake.